Join the discussion on our forums! Come discuss Tak Nozwhisker over in our dedicated Tak Nozwhisker discussion topic. How this card is considered tier 5 trash in hearthpwn forum? It's insanely good with Tog Scheme and Prep + Espionage. For cards like this, I wish they had some sort of built-in weak battlecry just to show their effect without needing a second card so they aren't a sitting duck. You know, something like "Battlecry: Choose a minion. Shuffle a copy of it into your deck" and the effect. Maybe reduce the stats a little bit if it's too OP, I dunno. That's what they did with Kalecgos. The amount of text on a card is a limitation though; for better or for worse HS cards never go beyond 4 lines of text, and I don't think it would all fit on Tak. Perhaps a card with only the battlecry you suggest will exist one day. Whoever voice acts these kobolds really captures their personality. 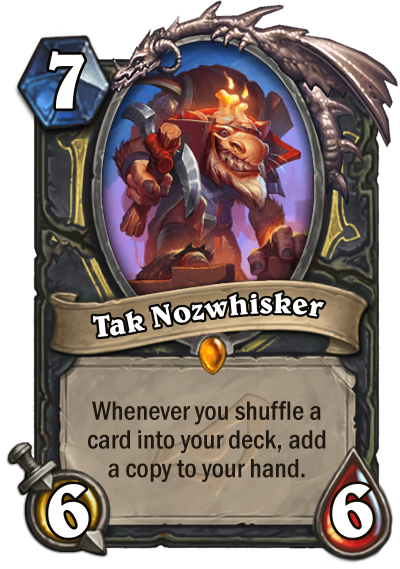 does this guy have to be in play for his effect to work, or is it like genn and baku? Has to be in play, otherwise it would state "Start of Game:"
thanks man. 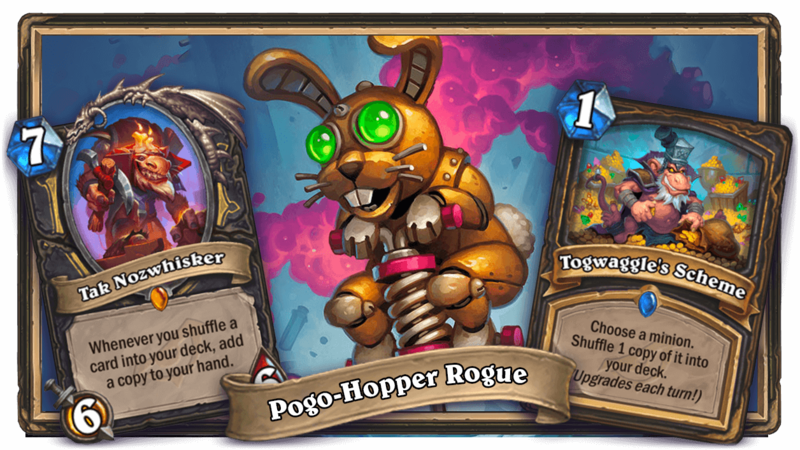 yeah after thinking about it, pogos would be the best deck in game if it just worked as long as you still had the card. at the same time though I'd have loved to see this in action. I went for heistbaron togwaggle and chef nomi for now anyway as could make some great decks with those new cards. you seen the nomi+unstable interaction yet? it's busted. Look Tak, you're great and everything, but can you PLEASE take up less time crapping out the cards? The game timer ain't gonna go easy on us while you take your sweet time slooooooowly spewing out Espionage card copies one by one. Just sayin', buddy. Forgot to add 2 mana cost to it, hope u remeber how lifecoach and superjj try Anub'arak before they leave this game at all. I would give you free observation statistics, cards in Rogue that cost 5 or more used in a small sample. i've just add a moment of hisory that i've remembered and my own observation on this. Because If you run after two hares, you will catch neither. This + Prep + Academic Espionage. HOLY TESS DECK! !